→What Is The Best Kitten Food For Your Kitten: Wet or Dry? If you have a kitten today you are fortunate to have many good foods available. At the same time, there are so many foods that choosing the best kitten food can be confusing. Should you feed your kitten a dry food or a wet food? Which food is the best dry kitten food? Which is the best wet kitten food? It would be nice if you could ask your kitten but she’s not saying! We have some advice for you about which kitten food to choose below. Wet or dry food for your kitten? The two basic types of kitten food you will see in stores and for sale online are dry foods (kibble) and wet food (cans or tins). Wet food can also come in pouches. Some foods are sold as fresh/frozen, and freeze-dried foods, but these choices are not as common. Most kitten owners today buy dry food or wet canned foods. Cats and kittens with special needs or health problems may need prescription diets or a specialty food. There are all kinds of specialty foods available today such as foods for indoor cats, hairball formulas, weight control diets, and foods for urinary tract health. A kitten doesn’t usually need specialty foods like these unless your veterinarian tells you that she has a health problem. However, it is not uncommon for an adult or senior cat to need a specialty food. Check with your veterinarian before buying one of these specialty foods for your kitten. 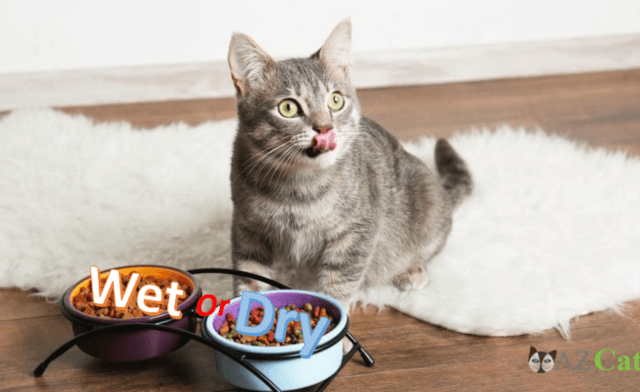 Should you feed your kitten wet or dry food? Wet or dry food for your kitten? This question has perplexed cat lovers for ages. There are benefits to both kinds of food. People who have more than one kitten or cat, in particular, may like dry food because it’s easy to feed and store and less expensive. While wet kitten food tends to cost a little more per ounce than dry food it is generally considered the best kitten food today. Many experts believe that wet food is the best kitten food. Wet food contains much more moisture than dry food. Evidence suggests that cats that eat dry food may not get enough water in their diet so feeding a wet food can be a healthier choice. Kittens and cats that eat a dry food diet can be more prone to forming harmful crystals in their urine, along with urinary tract stones. If your kitten eats a wet food diet that contains lots of moisture, the moisture can keep their system flushed out so these crystals and stones won’t form. Some wet food contains nearly 90 percent moisture so you can see why this food provides your kitten more liquid in her diet. Wet kitten food ( and wet cat food ) typically contains more meat protein than dry kitten food on a dry matter basis (DMB). Since cats are obligate carnivores and need plenty of meat protein in their diet, feeding a wet kitten food with lots of meat protein is good for your kitten (and your adult cat). Wet kitten food often has few carbohydrates compared to dry kitten food. Any dry food, including kitten and cat food, requires a certain amount of starch or carbohydrates so it can hold together and run through the pet food machinery that makes the kibble. That’s not true of wet/canned food. What kitten or cat doesn’t love wet/canned food? Kittens will almost always choose wet food over dry food. You’re less likely to have a fussy eater if you feed a wet kitten food. Both dry and wet kitten foods try to make their foods easy for kittens to eat but wet foods are, hands down, easier for kittens to eat than any dry foods. You can offset the slightly higher cost of wet kitten food by purchasing it online and buying it by the case. When you buy wet kitten food this way, there are usually great cost savings and the food is delivered to your home, saving you the trouble of carrying it from a store. Whether you feed dry or wet kitten food, it’s important to provide your kitten with plenty of fresh water at all times. This is especially important if you are feeding a dry kitten food since these foods do not contain much moisture. Some people like to mix dry and wet food so their kitten won’t become fixed on just one food texture. Whatever you feed, your kitten (and adult cat) need lots of water to avoid urinary tract problems. When choosing the best kitten food you should start by looking for a food that is specially made for kittens or one that says “all life stages.” These foods have the correct nutrients for a growing kitten. If you are feeding an all life stage food, you can continue to feed it to your kitten as she becomes an adult cat and even a senior cat. Kitten foods (usually labeled for “growth and reproduction”) are also a good choice for growing kittens. They will have exactly the nutrients that your kitten needs as she is developing in her first year. After that, you will need to change her to start eating an adult cat food. She won’t be growing as fast or need as many calories. Her nutrient requirements will be those of an adult cat after she’s a year old. You can usually find all of this information on the kitten food label. If it’s not on the label, check the manufacturer’s web site for information about the food. Much of this nutritional information is required to be provided by law. The best kitten foods will meet your kitten’s nutritional needs. Your kitten is an obligate carnivore so she needs plenty of animal/meat protein in her diet. Cats can’t convert some nutrients in their body. They can only get them from meat. Good kitten foods will provide lots of protein from meat. Try to avoid foods that have a lot of plant-based ingredients. That includes plant-based proteins. Peas and lentils are not a suitable source of protein for a carnivore like a cat. Kittens also need nutrients such as pre-formed Vitamin A, added taurine, and arachidonic acid because they cannot convert them or synthesize them in their bodies. Look for kitten foods that say “complete and balanced.” These foods should have all of the vitamins and minerals your kitten needs. Look for kitten foods that have the essential fatty acid DHA. DHA, along with Vitamin E, helps your kitten’s brain, ears, and eyes develop properly. It’s important for the entire nervous system. Kittens need a calcium/phosphorous ratio of about 1.2 to 1 so this is something else that the best kitten foods should have. You can check the label or (more likely) the pet food company web site for this information. Kittens (and cats) can’t digest carbs and starches as well as dogs can. The best kitten foods won’t have a lot of carbohydrates. If you are feeding wet foods, especially, it’s a good idea to rotate foods. This is especially true if you are feeding foods with fish. Many kittens and cats can become addicted to fish in their diet and refuse to eat any other foods. For this reason, some owners feed fish sparingly, even though kittens and cats love it. You don’t have to completely leave fish out of your kitten’s diet but do alternate it with other foods so your kitten doesn’t refuse to eat other foods. For the same reason, some owners like to include some dry kitten food in their kitten’s diet so she doesn’t refuse to eat it in the future if she needs to eat a dry food for some reason. Feeding your kitten a variety of foods is a good idea. No matter what kind of food you choose, try to avoid kitten foods that have artificial colors, flavors, and preservatives. Some of these ingredients have been linked to cancers and other health problems in cats. As mentioned earlier, most experts today believe that wet/canned foods are better for kittens and adult cats than dry foods because of their moisture. Because of a tendency to urinary tract problems, cats need a lot of moisture in their diet. They can get this moisture from wet foods (like wet kitten food for kittens) but it’s not present in dry foods. Do watch the calories you feed your kitten. Don’t let her become overweight; and make sure she is eating enough. Kittens need plenty of calories during their first year for growth but they also expend lots of energy just running and playing. Try to check her weight often. Pick her up and see how she feels. Ask your vet to check her body condition every time you visit to make sure she is keeping a good weight. If you have a kitten with a lot of fluffy hair, especially, it’s sometimes easy to think she’s bigger than she is. Most cans of kitten food are tiny – only about 3 ounces. Expect one of these cans to contain about 75-90 kcal or calories per can. In general, a 5-pound kitten can eat about 200 kcal/per day. Most kittens gain about one pound of weight per month. Of course, these are generalities. Some kittens grow very fast while others grow more slowly. Some kittens may eat like little pigs and others may show less interest in food. Some breeds and mixes are naturally larger than others. That’s why it’s important to check your kitten’s weight often. Talk to your veterinarian if you have any concerns. You should be aware, if you’re not already, that many cats become seriously obese as they get older. Obesity is a serious health problem in adult cats. Most kittens are not obese but the way you feed your kitten often sets a pattern and establishes health issues for the future. Most experts recommend feeding your kitten and cat regular meals instead of free feeding since leaving food sitting out all the time tends to encourage obesity. Measure the food you feed your kitten (and cat) so you know how much she is eating. Adjust the amount as necessary so she stays fit and trim. The best wet foods for your kitten will have plenty of animal/meat protein, the nutrients your kitten needs, and be low in carbs. It will be complete and balanced; and made specially for kittens (“growth and reproduction”) or for “all life stages.” The moisture in these kitten foods should help your kitten stay healthier. There are some good dry kitten foods if you prefer to feed a dry food. The best dry kitten foods will also have plenty of animal/meat protein and the nutrients your kitten needs. They should also be complete and balanced and formulated for kittens or for all life stages. However, many of these foods have more carbohydrates than wet foods. Their moisture content is low. If you choose to feed a dry kitten food, make sure you provide your kitten with plenty of clean, fresh water at all times.